A comprehensive Taub Center overview of pre-primary education in Israel finds a substantial increase in Arab Israeli pre-primary enrollment. The recent study also finds that the government’s latest decision to implement universal public preschool education from age 3 will require a significant financial investment. While the importance of early childhood education for long-term success is widely known and commonly accepted, Israel’s investment in education for its youngest children is provided in a piecemeal manner, with wide disparities in preschool enrollment and tuition costs. Despite the amended Compulsory Education Law (1984) which brought the statutory age of compulsory education down to 3, the law has been implemented only since 1999, and solely in localities with lower socioeconomic rankings, affecting only about one-third of Israeli children. As a result, the cost of preschool education for 3-6 year-olds varies widely depending on the education framework in which they are enrolled. Prices range from almost no monthly fee in the public system to NIS 3,000 or higher in the private system. Historically, resistance to full implementation of the law has been based on a number of factors: concerns about lack of funding for construction; concern that universal preschool education would come at the expense of other budgetary areas in need of expansion; belief that funds should be allocated to subsidies for low-income individuals rather than to universal education; and concerns about a lack of physical and organizational infrastructure in the Arab sector, which was to be the main beneficiary of the amendment. A recent Taub Center study written by Taub Center researchers Nachum Blass and Haim Bleikh with Hila Zaban from Ben-Gurion University, and edited by Deputy Director, Prof. Ayal Kimhi, merges educational and economic expertise in a comprehensive overview of Israel’s pre-primary education system, including the budgetary implications regarding implementation of the law. The Arab Israeli sector was to be one of the first beneficiaries of the 1984 preschool amendment, yet deficient infrastructure in the Arab sector was cited by policy makers as a potentially serious obstacle to the law’s implementation. According to Taub Center researcher Nachum Blass, the implementation of the Compulsory Education Law led to a 54 percent enrollment increase in the Arab sector between 2000 and 2005, yet only a two percent enrollment increase over the next five years. 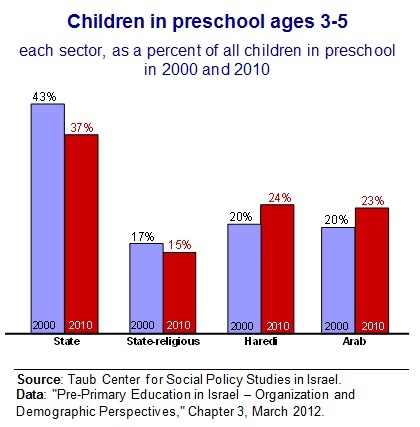 Despite this substantial increase, preschool enrollment rates remain lower in the Arab sector than in the Jewish sector. 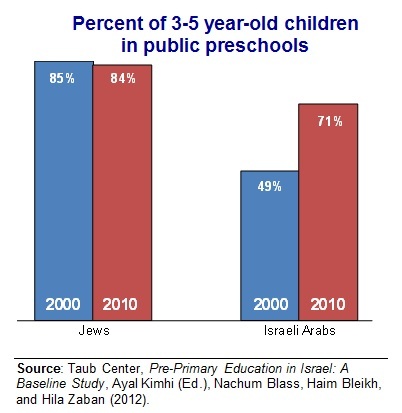 The first figure compares the preschool enrollment rate of Arab children with that of Jewish children. In 2000, 49 percent of Arab children and 85 percent of Jewish children attended public preschools. In 2010, by comparison, about 71 percent of 3-5 year-old Arab children and 84 percent of 3-5 year-old Jewish children attended public preschools. 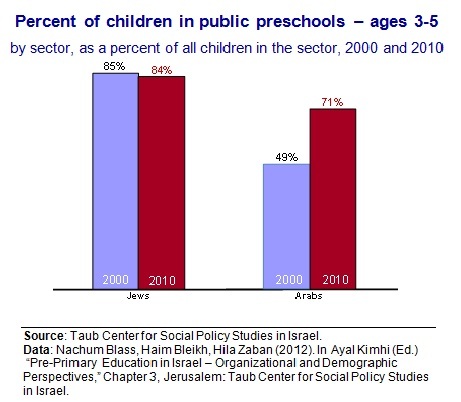 Attendance in private preschools was negligible in the Arab sector and grew in the Jewish sector. Within the Jewish sector, the number of 3-5 year-olds attending preschool increased approximately 27 percent between 2000 and 2010. During the same period, there was an increase of approximately 57 percent in Haredi (Ultra-Orthodox) Jewish preschool attendance, 15 percent in State preschool attendance, and 20 percent in State-religious preschool attendance. The second figure shows how quickly the distribution in preschool enrollment has changed within the past decade. The largest group of preschoolers in both 2000 and 2010 was in the non-religious State schools. However, this group’s share fell sharply over the past ten years, from 43 percent of the total to 37 percent. The smallest group – in the religious State schools – also declined in its relative share, from 17 percent to 15 percent of the total number of enrolled preschoolers in Israel. Enrollment share increases occurred in the Arab Israeli and Haredi schools. Each of these systems enrolled 20 percent of all preschool children in 2000. By 2010, these shares rose substantially, to 23 percent in the Arab Israeli schools and to 24 percent in the Haredi schools. Within the Jewish community alone, the share of Haredi preschoolers rose from 25 percent in 2000 to over 31 percent by 2010. As a side note, between 2005 and 2010, there was a 20 percent increase in the number of 6 year-olds remaining in kindergarten for another year, a phenomenon that is most prevalent within the Jewish population. According to Blass, “many of these 6 year-olds remain in kindergarten without proper justification.” In practical terms, this results in 10,000 extra kindergarten pupils, requiring an additional 350 kindergarten classrooms. A law in the books – but in the budget? One finding of the study relates to the expected budgetary impact of immediate, full implementation of the law. According to the Taub Center study, universal implementation of the compulsory education law amended in 1984 will involve a start-up cost of NIS 2.3 billion with additional operating costs of NIS 1.4 billion a year. This is a sizeable sum, implying an increase of about four percent of the entire current education budget at a time when budgets for existing programs are being threatened with cuts. These costs would include NIS 700 million currently paid each year by parents that would fall on the government, and NIS 670 million spent annually on operating costs for about 80,000 children aged 3-5 not attending public preschools as of 2010. This estimate reflects the addition of 2,700 preschool classrooms with 30 children per class and operating costs of NIS 250,000 per class. One-time costs could reach NIS 2.3 billion, including capital costs of approximately NIS 500,000 per preschool classroom for 2,700 classrooms, and teacher training for 4,000 additional teachers at NIS 250,000 per teacher. The authors suggest that these costs could be reduced through the use of existing structures and better use of manpower. The Taub Center study concludes that universal access to pre-school education is a worthy and important goal, as pedagogical research from around the world confirms. In various sectors within Israel, public preschool attendance has increased over the last decade, yet many parents continue to pay large sums for their children to attend private preschools. The Trajtenberg Committee, appointed by the government to suggest changes in socioeconomic policy, recommended implementing the Compulsory Education Law for children aged 3 and older throughout the country, moving gradually to a longer school day in preschools, passing legislation for universal supervision of preschools, and moving the responsibility for the daycare system for 0-3 year-olds to the Ministry of Education. Given the cost of implementation of the Compulsory Education Law for all children aged 3 and older and the historical foot-dragging in budgetary allocations for universal preschool, it remains to be seen whether the Trajtenberg Committee’s recommendations will, in fact, be implemented over the long term.